Keith Pardee is an assistant professor at the Leslie Dan Faculty of Pharmacy and the Canada Research Chair in Synthetic Biology in Human Health. In March 2018, my lab team from the University of Toronto’s Leslie Dan Faculty of Pharmacy embarked on an adventure. We set off from Toronto and headed to Ecuador. 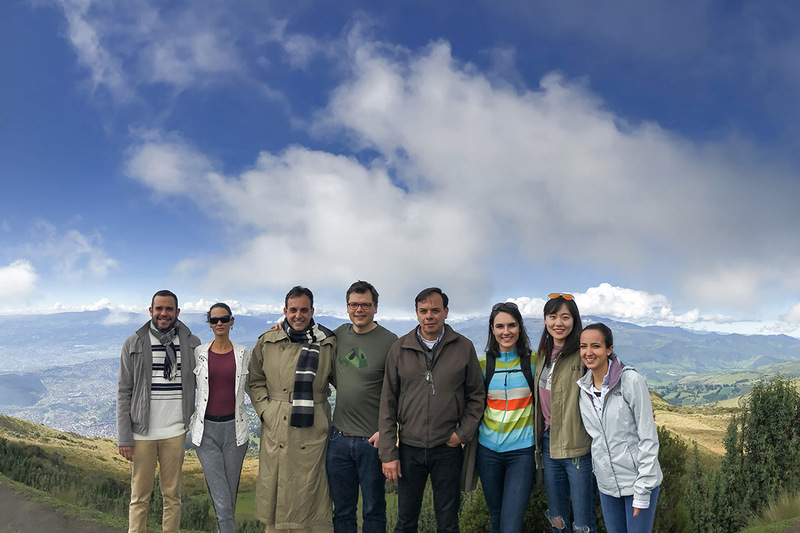 The purpose of our trip was to kick off the first leg of a multi-stage project where we are testing an entirely new rapid diagnostic technology in three Latin American countries. Where emerging infectious diseases are concerned, timing is everything. In 2014, it took more than 100 days for scientists to confirm that the disease spreading across West Africa was Ebola. In the months that followed, this region of the world experienced the worst outbreak of the virus in history. Recent reports about the return of Ebola to the Democratic Republic of Congo show that this kind of disease may become an ever-present threat. To save lives, diagnostic tools and systems need to be better, faster, cheaper, and perhaps most importantly, accessible. In 2016, in collaboration with Harvard University and MIT, we published our breakthrough diagnostic tool for the Zika virus that is paper-based and cell-free, effectively offering a promising, low-cost alternative to clinical lab-based molecular diagnostics. Now working as part of an international effort with colleagues from Ecuador, Brazil, Colombia and the United States, our next step is to further validate our technology by testing patient samples in these Latin American countries. We will be testing the efficacy of our diagnostics for Zika and other mosquito-borne infections. This lab-based phase typically requires expensive equipment to read the diagnostics and so, through some ingenuity and creativity, we’ve built a $350 portable device, affectionately named Plum, to replace the function of equipment that can cost tens of thousands. Once Plum is validated in the lab, we will move testing to the field where we aim to demonstrate that clinical-grade diagnostics can be brought to the point of care, even in remote and low-resourced areas that are often hardest hit during disease outbreaks. Our vision is that the technology we have developed will liberate the process of monitoring and diagnosing these emerging diseases from reliance on costly, lab-based testing that requires technical expertise. Our lab team put in many late nights to build our four Plum devices in preparation for our trip to Ecuador, where we met up with our international colleagues to deliver their devices and provide training. Plum is primarily made up of inexpensive, off-the-shelf electronics and we have used 3D printing and laser cut fabrication to house these components to create the portable device. Graduate students Yuxiu (Livia) Guo and Seray Cicek are the brains behind the device, which can process over 300 diagnostic samples in parallel. Plum serves as a low-cost plate reader, which is a common piece of equipment found in most clinical labs, and we use it to read the diagnostic reactions for mosquito-borne pathogens in patient samples. These diagnostics represent a new class of test that run on gene circuit-based sensors, which normally require living cells to operate. Here we have taken the gene circuits out of cells and instead embed them with the freeze-dried machinery of cells (much like instant soup) into paper so that we can deploy them in a bio-safe format. Importantly, by freeze-drying we can also distribute and store our diagnostics at room temperature so that constant refrigeration is not required. We arrived in Quito, Ecuador after a relatively uneventful but long nine-hour flight. After taking our carefully packed devices through secondary inspection at customs, we were on our way to INSPI, Ecuador’s National Institute of Public Health and Research centre in Quito. We dropped our bags at the hotel and set out for dinner. After dinner, we inspected the devices. Two out of three had made the journey intact. One needed some tweaking to fix a dislodged wire – a tense few hours, but once we found the problem, we were back on track and ready for the next day. We kept one Plum in Toronto so we could troubleshoot from a distance. Livia and Seray led in-depth training sessions to help our counterparts get familiar with the technology and to make sure everyone felt comfortable using both the device and the freeze-dried, paper-based sensors. Once back in their home lab, each team will be responsible for running existing patient samples through Plum and then comparing results to conventional techniques When we start to move testing into the field, we expect Plum’s portability to shine. Plum can be set up in someone’s house, at a local clinic or even on the back of a truck – not needing battery recharge for at least eight hours. As part of a public symposium hosted by INSPI and Universidad Central del Ecuador, all the collaborating scientists on the project presented their work to an audience of over 100. As we discussed our work and shared ideas, the value of building long-term research partnerships became clear. Often, international projects are limited by the logistics of resources, making it difficult to have long-standing research capacity outside of our lab here in Canada. Because our funding from the Canadian Institutes of Health Research (CIHR) is in partnership with the International Development Research Centre (IDRC), support can flow directly to our partners’ institutions. This provides us with a much more adaptive program, so we can respond new diseases if they emerge, and allows us to have a sustained presence in the field. This longer-term engagement gives us the opportunity to work with scientists who understand the nature of the problem on the ground – the clinicians, virus, and vector experts. I am hopeful that our technology will integrate more smoothly into direct patient care. Livia and Seray led a second round of practice sessions with their counterparts to work out any kinks using Plum. The principal investigators on the project also met to establish testing protocols that will ensure a consistent approach across all five countries This consensus approach is crucial to achieving strong data. We took a day off from the lab to hike the Pichincha Volcano, the “urban” volcano in Quito. As we climbed to the ridge of the volcano, we saw the city expand beneath us. It was beautiful. On our last day, the entire project team travelled three hours to Yachay Tech University, a public university in Urcuqui, Ecuador. Yachay Tech is part of a project led by the government of Ecuador to establish a hub for technological innovation, and is an exciting example of the potential for the area. The university was built on land that used to be a sugar cane plantation. We toured FabLab Lachay, a digital fabrication lab with 3D printers and equipment for prototyping. The lab was full of cool, innovative fabrication-based projects, including an amazing wheelchair laser cut out of plywood! Land in Toronto. Back to the lab. We’re now back in Toronto and working on the next phase of the project – field deployment. This work involves the development of new molecular and hardware technologies for applications in remote and low-resource settings. As part of this, we are working with Aaron Wheeler, a professor in U of T's department of chemistry, to develop a simple and low-cost user interface for our diagnostics. Recently, the Wheeler lab has used their technologies under field conditions and this experience brings a lot of depth to our current project in Latin America. We expect to be back in the field in Latin America during rainy season, 2019.